Identify is a beautiful learning wall will help you explore British values in an engaging way. It explores a wide range of national characteristics, history, institutions, and mindsets, including democracy, the rule of law, freedom of faith and liberty. We specifically designed the Identify Wonderwall with pupils spiritual, moral, social and cultural development in mind. With over 100 unique illustrations to choose from you can easily personalise this learning wall to suit your school and reflect its values. 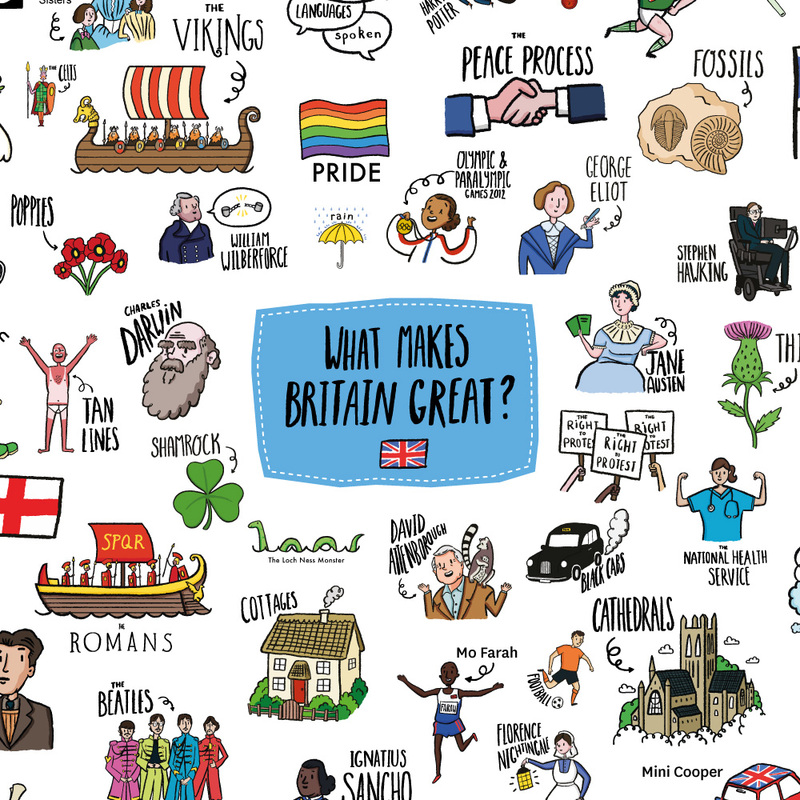 What do you think makes Britain great? We can create bespoke content to highlight what you think makes Britain great. This is an excellent way to personalise this graphic and create something really special for your students. There are so many amazing things that make Britain unique; Identify gives you the chance to share what you find most novel, exciting and important about Britain. Whether you want to showcase Britains diversity, expound on it's sporting history or show the amazing historical landmarks dotted across the islands - Identify is the perfect platform to present it! Adapt Identify to your region. Why not teach your students about local history? We can tailor the Identify learning wall to highlight local heroes, history and achievements to brings your school's unique past to life. There are countless ways to make every one of our Wonderwalls unique to your school. Choose the style for you. Get the pattern version of Identify to bring some fun and colour to your school corridors or classrooms. A great learning wall for Primary Schools. For a more in-depth look at British values get the map version of identify. The perfect learning wall for encouraging spiritual, moral, social and cultural development at Secondary School.